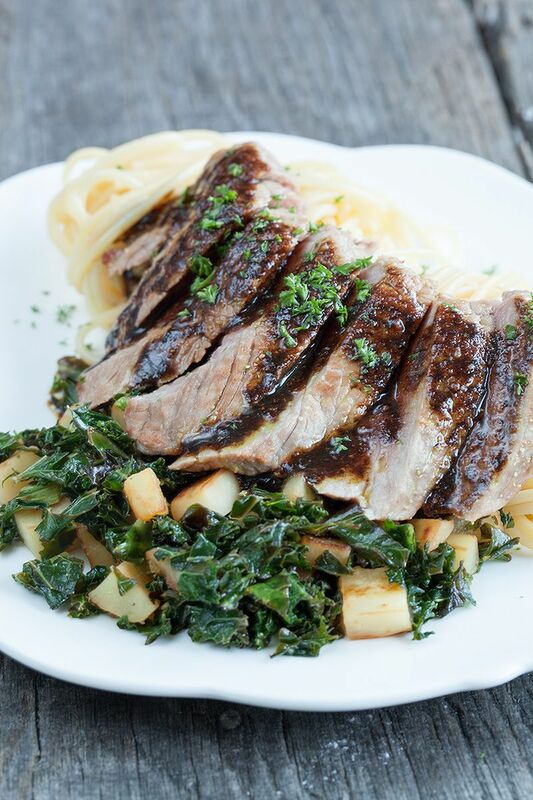 Ever thought about combining beef kale and parsnip? We did! Add spaghetti to complete the dish and the best thing is, it's ready in half an hour! Start by boiling a large pan of water with salt for the pasta. Get your beef out of the fridge to let it warm up a bit until it’s a little bit like room temperature. If your kale isn’t already cut into small pieces, cut them smaller. Peel the parsnip and cut it into cubes. When the water has come to a boil, cook the pasta for about 8 minutes depending on what kind of pasta you’re using. Heat a little bit of butter and olive oil in a small skillet. Pat the steaks dry using paper towels and cook the steak on high heat for 3 minutes on each side. If you want your steak to be well done, cook it a little longer. Transfer to a plate and cover with tin foil and leave it there to rest until you are ready to eat. If that takes a while, keep them warm in an oven that’s set on low heat. If the butter is almost gone, add some more. Stir in the ras el hanout and cook for about 2 to 3 minutes. Season with pepper and salt. That’s all there is to create this delicious sauce. Meanwhile heat olive oil in a large skillet and add the parsnip. Toss it around and after about 2 minutes, add the kale and cook it a few minutes more. Season with pepper, salt and lemon juice. 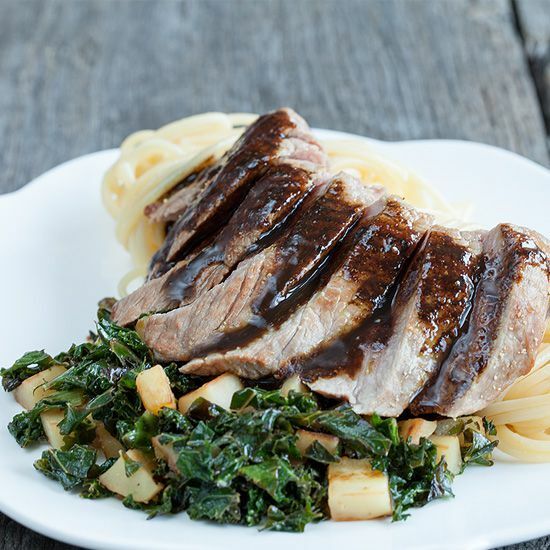 Divide the kale and parsnip mixture over 2 plates. Drain the pasta and also transfer it to the plates. 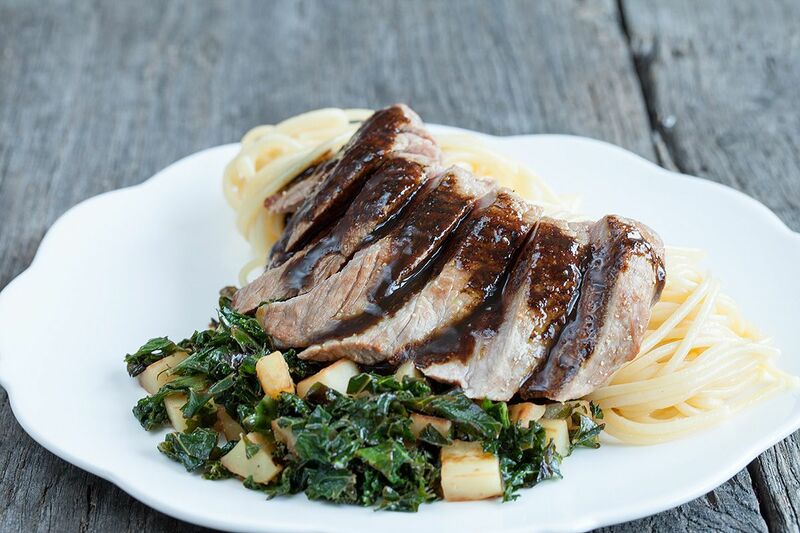 Slice the beef in slices and place it on top of the pasta and kale. 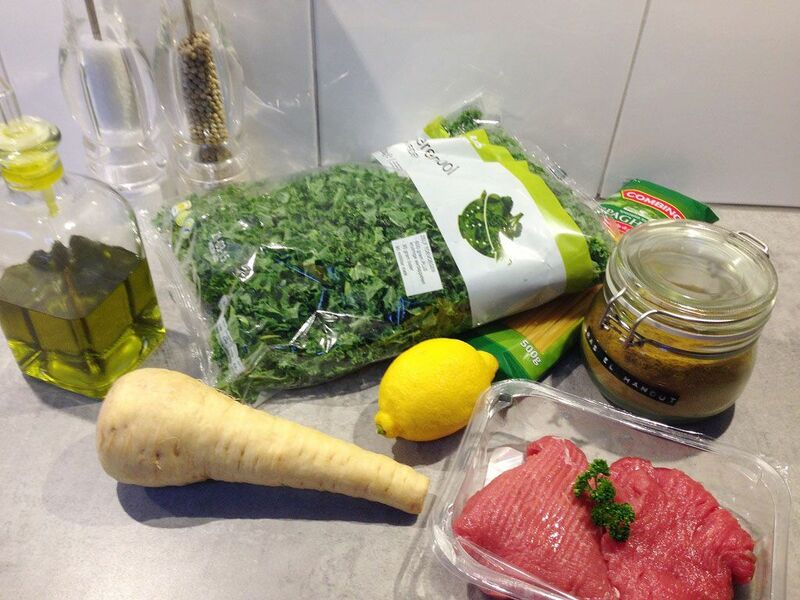 Spoon the sauce over the beef and finish it of with some chopped parsley if you like.